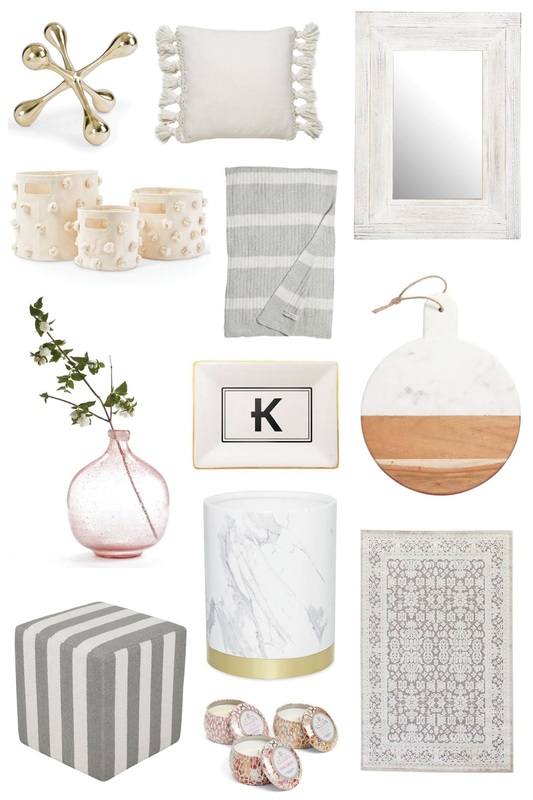 With only a few days left to shop the Nordstrom Anniversary Sale, I wanted to share some last minute finds for the home front. I feel like I've been cheating on fashion with furniture since we moved into our place and I'm trying to create a coastal-feel with lots of linens, whites, neutral colours and pops of blue. I actually have one of these Regina Andrew Jack's and love that it always finds a new home in our home from bookcases to kitchen counters to books on our coffee table. This cozy blanket is giving me all the fall feels and I can't help but think of being curled up with it on the couch. Since storage is limited in our house, I'm all about storage baskets lately. From magazines to blankets or even shoes by the front door, I'm crushing on this Pom Pom Set for our place. Last but not least, catch all trays are a must have in our house. This monogram option is not only chic but would work great on a bedside table, on a console table for keys or even in the bathroom for holding dainty jewelry. Don't forget that prices go up August 6th so be sure to snag items while you can. In case you missed, I did a major round of finds here and my favourite under $100 finds here. I also shared what I bought at my local Nordstrom store and how I reworked pieces 2 ways. The pink recycled vase is so pretty! You know, when I tend to buy a house, the first thing I will consider that is the furniture from that house. It's really important to make first impression with visitors. Thanks for great share!